I love this watch. The dial is very easy to read, even without eyeglasses. The rose gold tone and rhinestones are very pretty - not too flashy. My only complaint is that the finish is wearing off on the bottom. My 16 year-old granddaughter loves this watch. Just enough bling to catch your eye, but not so much that it can't be an everyday watch. Beautiful watch. Rose Gold is perfect. Great quality. Beautiful watch. I purchased a larger more expensive fossil watch just prior to purchasing this one, but it arrived not working. This new watch I chose as a replacement to the other nonworking one has some time keeping issues in less than 24hrs of wearing. Twice I've found it to be slow and once fast time keeping. I'm not confident in this time piece and it's ability to provide me with accurate time keeping, I'm uncomfortable solely relying upon it for time. 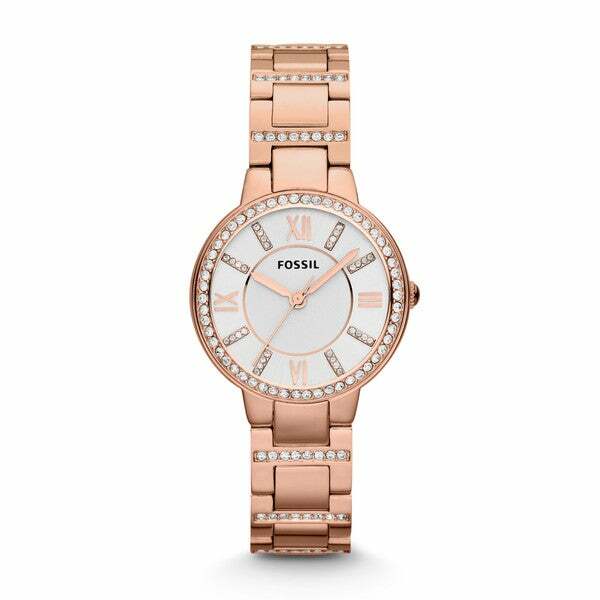 I probably will not purchase another fossil watch based upon two sub par purchases. This watch Looked so much prettier in person than on the web. My daughter- in- law was do excited for her birthday watch. The color and slim fit was perfect for her wrist. The watch also has links that you just snap off and there is no Jeweler is needed to adjust the size. Very well made watch for the price. I love this watch. It looks very stylish and comfortable to wear. The color pops on every outfit and is even nice with white gold and silver. The price was awesome. I love my purchase. Wife loves this watch, she wears it for both formal and informal occasions, provided it goes with her choice of attire for the evening. Very pretty and shiny.Looks very fancy and elegant. I bought this for my daughter for her birthday, it was exactly what she wanted. It works great and is so beautiful! Now I want one!